Not to be confused with Sea captain. On large US ships (e.g., aircraft carriers), the executive officer (XO) may be a captain in rank, in which case it would be proper to address him by rank. Often the XO prefers to be called "XO" to avoid confusion with the CO, who is also a captain in rank and the captain of the ship. The same applies to senior commanders on board US aircraft carriers, where the commander and deputy commander of the embarked carrier air wing are both captains in rank, but are addressed by the titles of "CAG" and "DCAG", respectively. 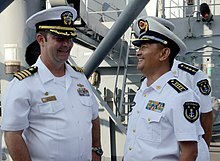 Captains with sea commands generally command ships of cruiser size or larger; the more senior the officer, the larger the ship, but ship commanders do not normally hold a higher rank than captain. In the Royal Navy, a captain might command an aircraft carrier, an amphibious assault ship, or the Ice Patrol Ship, while naval aviator and naval flight officer captains in the U.S. Navy command aircraft carriers, large-deck amphibious assault ships, carrier air wings, maritime patrol air wings, and functional and specialized air wings and air groups. Maritime battlestaff commanders of one-star rank (commodores or rear admirals lower half) will normally embark on large capital ships such as aircraft carriers, which will function as the flagship for their strike group or battle group, but a captain will retain command of the actual ship, and assume the title of "flag captain". 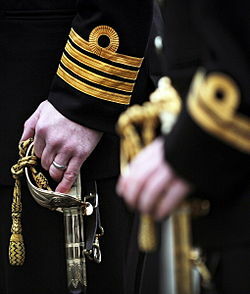 Even when a senior officer who is in the ship's captain's chain of command is present, all orders are given through the captain. The following articles deal with the rank of captain as it is used in various navies. ^ The Polish Navy is, however, a notable exception with "naval captain" (Polish - kapitan marynarki) in the OF-2 rank of lieutenant or captain lieutenant and the OF-5 rank being a "Commodore" (Polish - komandor). ^ William P. Mack; Harry A. Seymour; Lesa A. McComas (1998). The naval officer's guide. U.S. Navy: Naval Institute Press. p. 91. ISBN 978-1-55750-645-0. ^ J. D. Fontana; R. M. Hillyer (1990). General Guide to NOSC Civilians Boarding Navy Ships (PDF). San Diego: Naval Oceans System Center. p. 9. Archived from the original (PDF) on 2011-01-26. Retrieved 2009-07-21.